Today marks my 8 year dating anniversary with my hunk a hunk a burnin’ love. What was really burning that night though was my throat after all of the moonshine I had been swilling back. I was drinking the stuff like it was apple juice in a beer funnel. Homemade, smooth as silk moonshine will get you married, y’all. 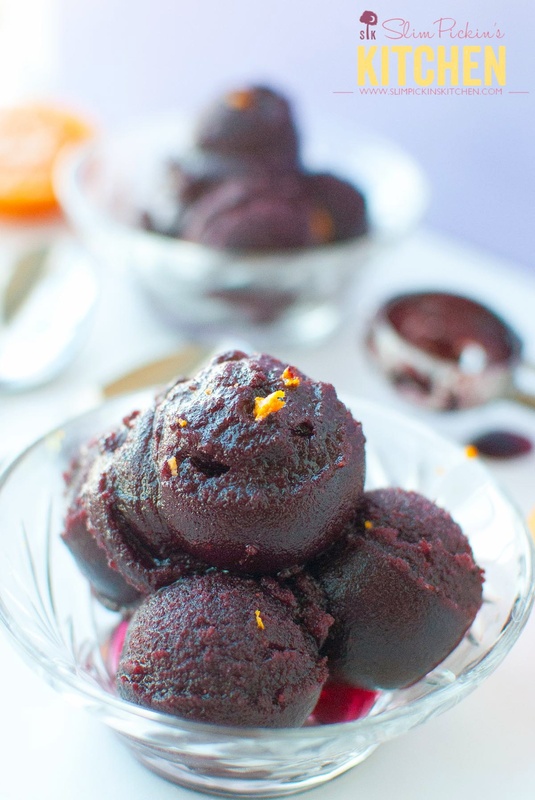 This cool and boozy blueberry sorbet is my tribute to that super interesting night so long ago. It’s fun and refreshing, exciting and cool…but it’ll take you on a journey that you never expected if you have too much at once. You can read all about our love story here if you’re interested. 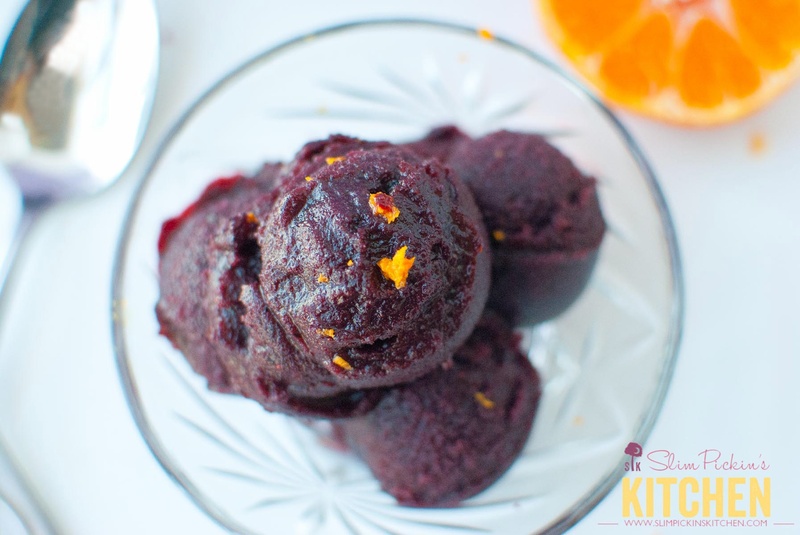 My favorite part about this blueberry sorbet is the booze (clearly), but it’s also sooooooooooooooooo easy I’m not even sure I can truly call it a recipe. It requires nearly next to no planning other than having frozen berries in the freezer and vodka in your bedside table liquor cabinet which, lezbehonest, we all do…right? Oh, you’ll also need a personal blender or a regular blender or a food processor or a mini food processor or a really, really, really good hammer. If you can’t make blueberry sorbet because you don’t have 10,000 gallons of blueberries at your disposal then you can make raspberry or strawberry or peach or a mango mixed berry blend. Whatever frozen fruit you have stowed away in the freezer after an overzealous post New Year’s resolution grocery run where you vowed to DRINK MORE SMOOTHIES! should work. 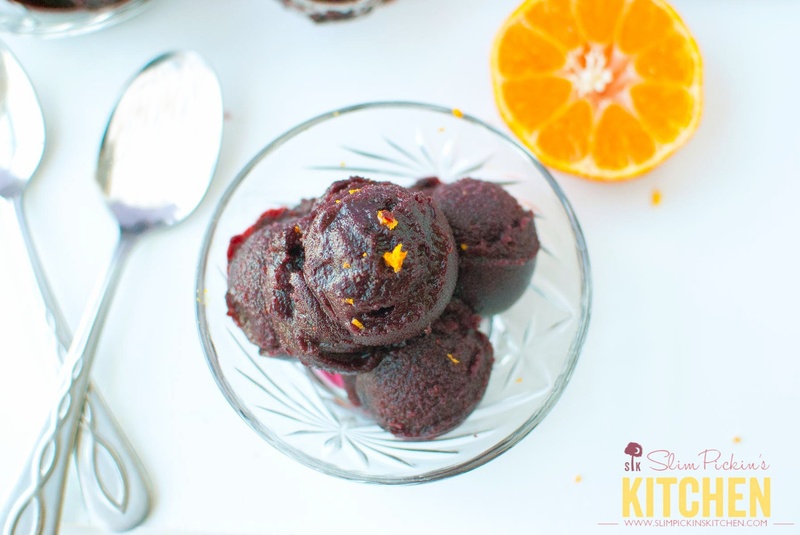 This boozy blueberry sorbet would also make an excellent and elegant Valentine’s Day dessert for those of you who like to avoid the crowds and dine in at home. All you have to do is add all of the ingredients to a blender (I used the personal smoothie cup thingy from my Ninja Pulse) and blend it until smooth. Once frozen, dump it into a freezer safe, air-tight container and freeze for 3-5 hours. 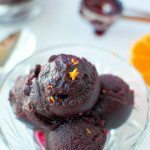 Absolutely no pain, but you’ll gain: A simple sorbet recipe you can make again and again, a boozy sweet treat that’s elegant and satisfying, and a huge, happy smile from the special person you served it to…especially if that person is you. 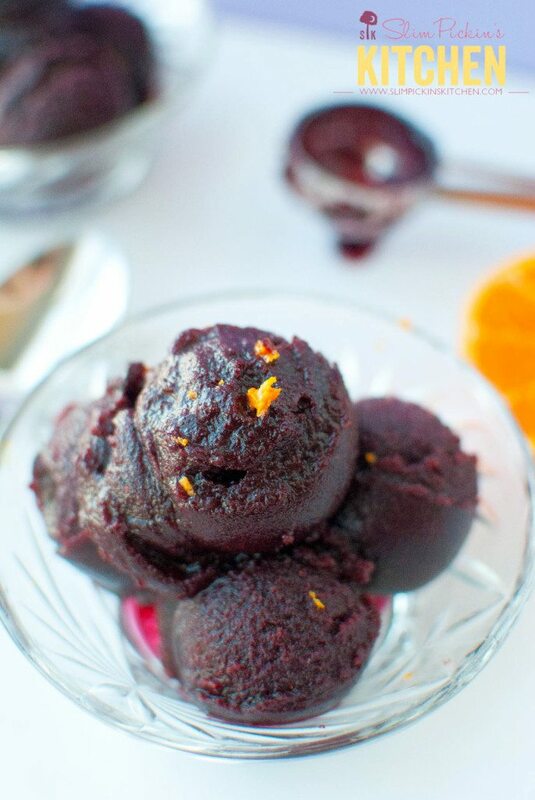 Frozen blueberries and vodka are transformed into a no churn, super simple boozy blueberry sorbet! Transfer to a freezer-safe, air-tight container and freeze for 3-5 hours. Scoop into individual sorbet dishes or bowls. NOTE: Unless you store this in a deep freezer, there should be no need to thaw any before serving. Love it. I had said we were going to celebrate on the 13th, then not leave our house again until church on Sunday. Then my church announced a special marriage ministry event on the 13th and I started to panic…WHEN will I celebrate Valentine’s Day? I just want to sit on my couch and alternate rom-coms with action movies while eating popcorn and nachos all day on the 14th! What to do? The answer is…I still don’t know. But I’m totally stoked to make this, except probably with strawberries because a certain one of us doesn’t like blueberries, courtesy of a bad experience with a blueberry Blizzard as a child. It will be easy. I will probably eat this ALL day on Valentine’s Day. And it will be red…so even better, right?